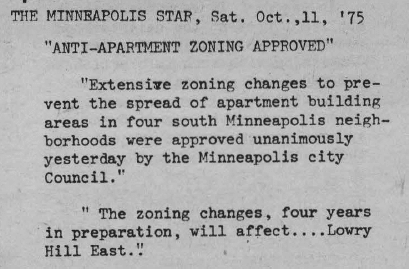 Last September, Council Member Lisa Bender’s office held an informational meeting regarding a proposed Lowry Hill East historic district. It was a homeowners-only affair, intended for those whose properties would be included, though there were plenty of party crashers: eager homeowners from outside the proposed boundaries, a guy from Kingfield, and at least two renters. I showed up late, right about the time it devolved into a sort of call and response routine; people were slapping each other on the back over their very, very historic properties (Hey Joe, I don’t see your house on this map, it’s pretty historic… Yeah and what about Bill, his beautiful home isn’t on here either). Our former Council Member was there to suggest that City Planner John Smoley take a historic drive-by on the 2400 block of Aldrich. It was an amazing scene (in 2017, this publication will be endorsing whichever Council candidate promises to hold the greatest number of wildly entertaining historic district info sessions). In the same article, former Tuthill aide and current LHENA President Leslie Foreman describes the desire of some neighborhood residents to expand the historic district as far south as 28th Street. I can confirm the accuracy of this statement because the guy directly behind me at the September meeting was muttering “the whole damn Wedge” in response to Smoley’s question about the preferred composition of the historic district. Some of the dissatisfaction with this proposal has to do with the fact that the included properties, while certainly the most deserving of historic status, are already zoned R2 (low density, two-family district). New development isn’t a threat in this area. For the anti-density folks, this historic designation won’t solve their problem; it just means a bunch of regulatory headaches for homeowners, without any of the desired downzoning-like side-effects. The blocks contained within this historic district were rezoned to low-density in 1975; this is true of most of the neighborhood south of 24th Street. LHENA, which was formed in 1970 to advance the cause of downzoning, declared victory. The northern part of the neighborhood, however, remains an area of high density zoning, which explains the current obsession with the idea of a North Wedge Historic District (Save the apex from R6!). 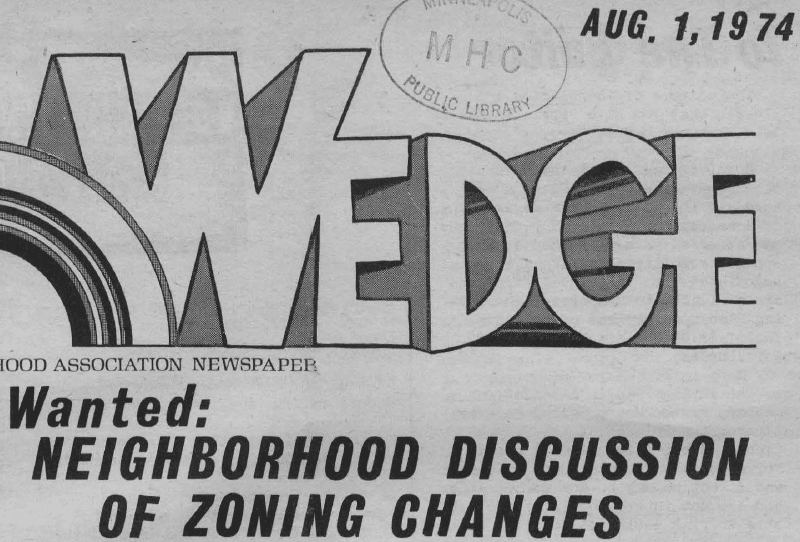 Rezoning the north Wedge is the final piece of unfinished business in a 45-year battle against apartment buildings (and their resident dealers, pimps, prostitutes, and motorcycle gangs). Everything was so explicit back then. R6 zoning (dark green) dominates the north Wedge. Kitty cats added for effect. This is not to say the proposed district doesn’t have its share of fans. Council Member Bender has indicated the response from affected homeowners has been largely positive. And despite the desire of some residents for a far larger historic district, the LHENA Board put their symbolic weight behind the nomination last week. The organization has also formed a “historic” committee, which will no doubt have expansion on its agenda long into the future. A crazy person’s ultra-expansive Historic District to End All Historic Districts. Minutes from September 22, 2014 informational meeting. The Minneapolis Map of Officially Historic Stuff. Designation criteria for Minneapolis Historic Districts. 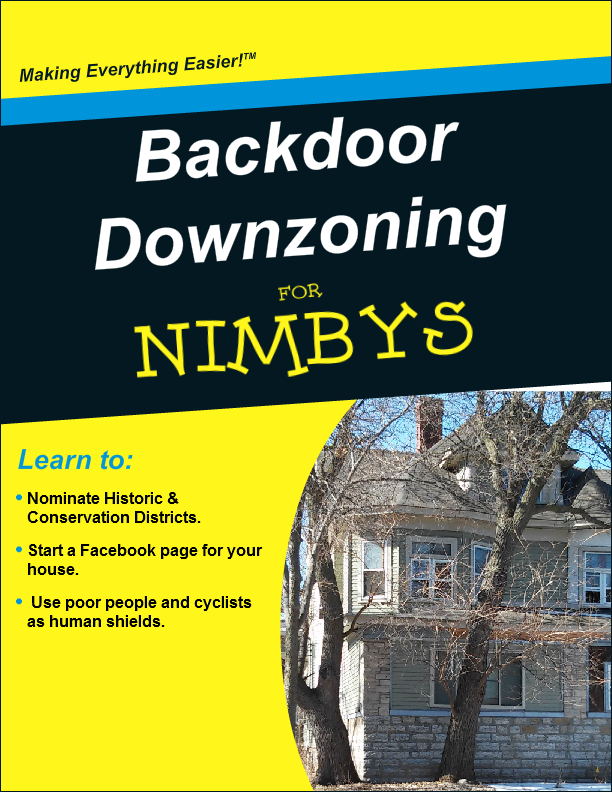 Check out my For NIMBYs series on Amazon.